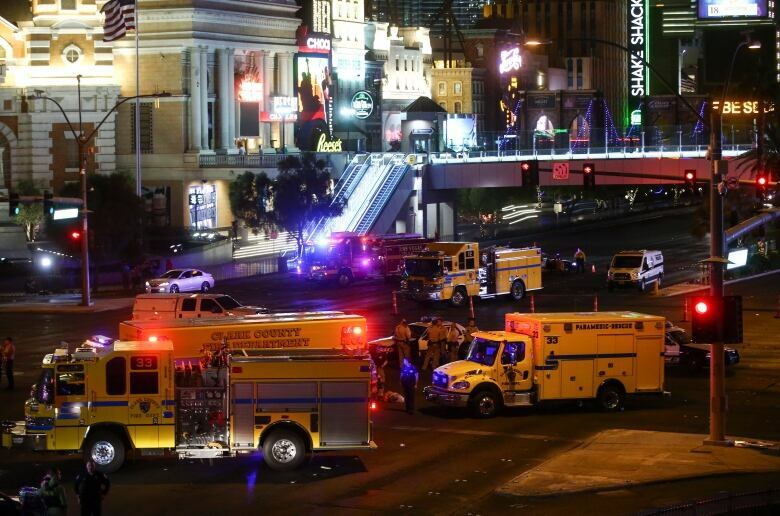 An Ottawa couple is shaken but unhurt after a gunman opened fire on a crowd attending a concert in Las Vegas Sunday night in the deadliest mass shooting in modern U.S. history. 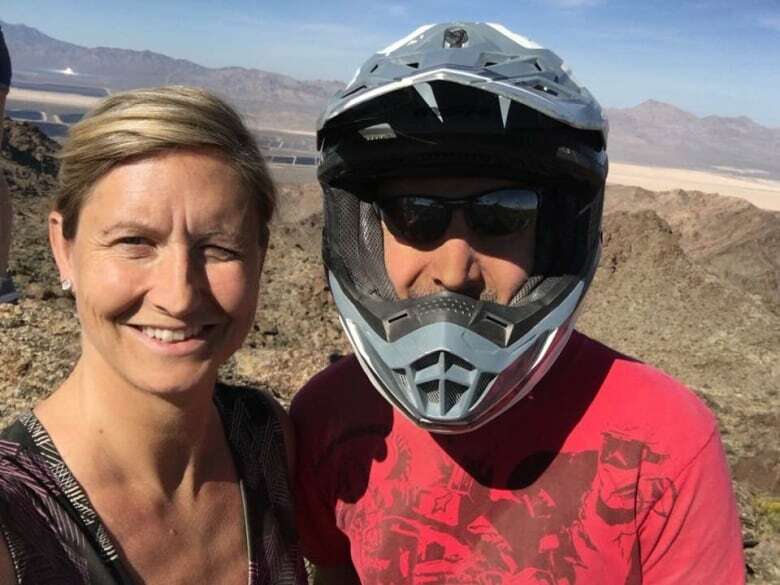 Brad Sherk and Lindsay Hugenholtz Sherk were on their honeymoon in Las Vegas when gunfire erupted from the 32nd floor of a nearby hotel. At least 58 people died and more than 500 were injured when bullets sprayed the crowd of people gathered for an outdoor country music festival. "We heard a pop, pop, pop. Everyone kind of looked around, and we thought maybe someone was just doing fireworks," said Sherk. "And then the second round came and you could tell it wasn't fireworks." Sherk said he saw country music singer Jason Aldean leave the stage. Another concert-goer in their section began shouting at people to get down. "So my wife and I, we dropped to the floor and the rounds just kept coming," Sherk said. "It was so many rounds. We were just holding each other's hands." Sherk said he wanted to flee, but his wife convinced him to stay put. "She just kept saying to me, 'Stay down, stay down, stay down,' cause I wanted to get up and start running. Cause that's your first instinct. You're full of adrenaline. You're scared. You're not thinking straight." "We couldn't tell whether the gunfire was coming toward us or not," said Hugenholtz Sherk. The couple did eventually crawl down the aisle and made their way to the field, taking cover as more gunshots erupted. Brad Sherk described a scene of utter chaos, with people crying, screaming and running with chairs and tables covering their heads in an effort to protect themselves from flying bullets. The couple at first hesitated to head for an exit. "We didn't know if it was a terrorist attack, and if they were going to hit all the entrances and basically just line people up," Sherk said. While making their own way out, Sherk said they witnessed desperate people attempting to climb the walls to escape. It's miraculous that more people weren't killed, Sherk said, because "the amount of gunshots that went off, it was just so unbelievable." First responders directed the couple and other concert-goers to safety at locked-down hotels, where they attempted to reach family. Today, the couple returned to their own hotel, which is part of the Mandalay Bay Hotel and Casino resort complex. That's the same resort where police say gunman Stephen Paddock was found dead. Looking out the window, "we can see all the debris, we can see the police doing the investigations," Hugenholtz Sherk said. They also have a view of the window from which the gunman is believed to have fired. "We can clearly see the blind blowing in the wind. It's very surreal," Hugenholtz Sherk said. The couple is hoping to put that view behind them soon, and return to Ottawa.